I don't start training my hares until they are 10 weeks old. I was told that it is better to let their bones strengthen and I can see the sense in this. I am probably in a small minority who don't start training Hares from a young age. However I find that it is no hinderence to the speed they learn. I think you need a surface that they can grip onto. This sheet is not ideal but I think shows the sequence of improvement perfectly from the first one where she is pulling back and how she gradually relaxes along the sequence until she is posing beautifully. So these are her sister. I hardly touch her ears but just a gentle lift of the head which makes a lot of difference to the final pose as you see in the sequence. The Belgian Hare has a long history of exhibition in the United States going all the way back to the 1870’s. It seems that most rabbit breeds evolve over time, changing sizes, shapes, and colors. The Belgian Hare is an exception to that rule. 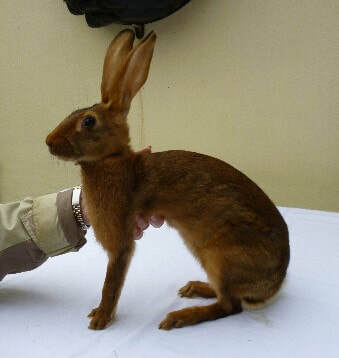 There has been very little change to the standard of the Belgian Hare over the past 100+ years. In 1915 when the first standard of perfection was printed by the National Pet Stock Association, Belgian Hares had 20 points for “Rich Rufus Red” color and another 10 points for ticking, just as today’s standard calls for. Additionally the 1915 SOP has 10 points on “feet and legs” just as we do today. 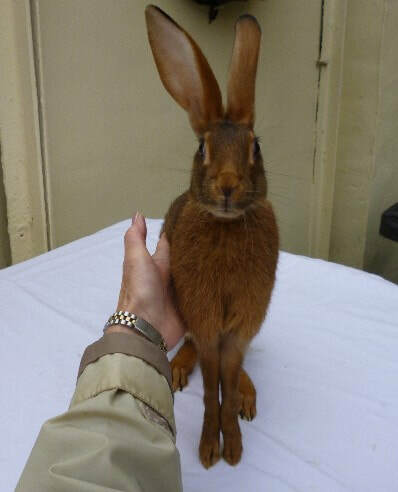 It is amazing to think that breeders of the Belgian Hare have been able to continue with the same standard for 100+ years without major change. 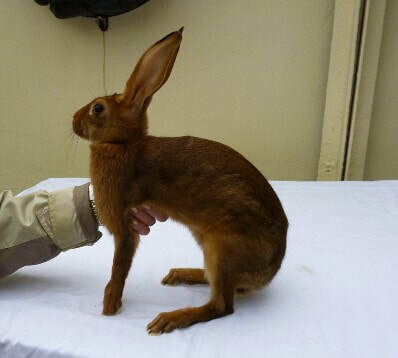 To judge or evaluate a Belgian Hare it is necessary to be aware of what makes the Belgian Hare unique. a) Length – The most important aspect of Feet & Legs is definitely Length. Without length the Belgian Hare cannot have proper topline or length of body. b) Size – Another important aspect of the Feet & Legs is the size of bone. Belgian Hare’s have a FINE bone. The important thing to understand is that bone refers to the skeletal girth of the animal relative to its size. Do not expect the Belgian Hare to have the same size of bone as a Britannia Petite. Both call for fine bone, but with Belgian Hares being 3 to 4 times as large as BP their fine bone will be larger. c) Straight – The Feet & Legs of a Belgian Hare should be straight. Slight bends or arcs to the bones can be faulted, while severe bends or arcs should be disqualified. d) Ankles – The final aspect of the Feet & Legs are the ankles. The Belgian Hare is to be posed with the front legs completely extended. There should be no appearance of an ankle on the front legs when they are properly posed. If the rabbit does not carry the strength to sit on the extended front toes the rabbit should be faulted. Additionally weak rear ankles can cause the rabbit to walk/move on the insides or outsides of the hocks and should also be faulted. *Note: The key to evaluate the feet and legs is to get full extension of the limbs. 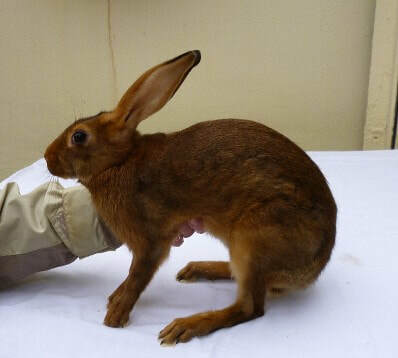 During your initial examination of the Belgian Hare, while turning the rabbit over to check teeth, etc., pull the front legs out to check their straightness and to evaluate the size of bone. Then slide your hand down the belly of the rabbit to make the hind legs extend. Then place the rabbit on the table to pose it. The pose of the rabbit is very important and we will cover it extensively next. The Belgian Hare is to be posed in such a way that it appears to be at attention. Much like a real Hare would be in the wild when danger approaches. This “alert” stance can be imitated by any one of the following methods. Each of the methods that I will describe have good attributes but none of them is perfect. The perfect method is the one that works best for you as a judge and for the Belgian Hare that you are working with at the time. 1. The Body Stretch – I have this method first on my list because this is the method that I prefer because I feel it gets the maximum extension of BOTH the front & rear legs of the Belgian Hare. No other posing method allows the Belgian Hare to show off its hind legs like this method. This is a great time saver for judges because the Belgian can be evaluated while being held and the judge doesn’t have to wait for the rabbit to “lock up” before evaluation. Also, any other posing method, the Belgian will need to be allowed to move to evaluate the hind legs and the hindquarters height off the table. a. Step One: Use your right hand to control the head from the left side of the Belgian. A firm grip is necessary so that the Belgian doesn’t have a chance to bite. Slowly raise that hand until the front legs are fully extended and the Belgian is on its tippy toes. b. Step Two: Use your left hand to slowly raise the hindquarter of the Belgian. Be sure to be off to the right side of the animal so that you can get a good side view of the animal, in case you can’t get it to lock. 2. The Shoulder Pressure Method - (this is an excerpt from the Belgian Hare Guidebook). a. 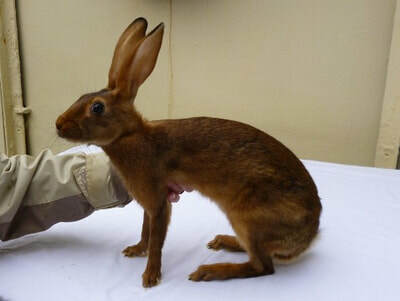 Set the hind legs in a natural position so the Belgian Hare’s weight is on them. b. Raise the Belgians chest with one hand while the other hand applies pressure on the Belgian’s back. c. Once the Belgian’s front legs are extended, wait for the Belgian to push back on the pressure you are putting on its back and it should lock up. d. Step back and evaluate. 3. The Head lift method – This method is similar to The Body Stretch method. Only the second hand does not raise the hindquarter, but rather it is used as a stopper for the hindquarters so the Belgian doesn’t scoot backwards. Of course there are hundreds of other methods with slight variations of the three methods mentioned, but these are the three most common methods. Do whichever one you are most comfortable with and works best for you. Some Belgians are trained in specific methods and will react best when those methods are attempted, so it is important to learn all three and try each of them. There is one method that has been commonly used in the past, but I do not recommend it. That is the ear lift method. Basically the Belgian is lifted from the table by its ears until it locks a pose. While this does give the Belgian a very nice pose, the damage that can be done to the ears makes this type of pose too risky to rely on. important aspect of the type of the Belgian Hare, but be sure to remember that the topline is not the ONLY aspect of proper Belgian Hare type. 1. 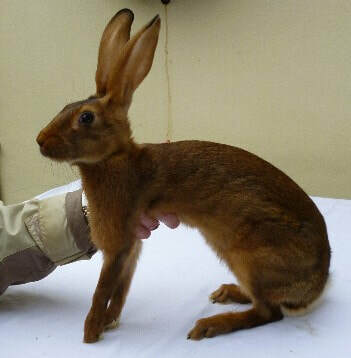 Topline – The topline of the Belgian Hare is simple to describe. “A continuous arc”. The step or steepness of that arc is a factor of two things, length of the rabbit & depth of the rabbit. The idea or concept of step is sometimes difficult for people to grasp, and I explain it like this: If you catch a 5lb Bass on your fishing pole, the entire pole will bend in a continuous arc. Now if you catch a 35lb Catfish on your fishing pole, the entire pole will bend in a continuous arc, just like it did for the 5lb Bass right? Not exactly, the 35lb Catfish will definitely put a steeper arc on your fishing pole. You are looking for middle ground. The arc with the 5 lb Bass is too flat while the arc with the 35 lb Catfish is too sharp. To put it in mechanical terms, you are looking for a full and continuous electric pvc conduit long sweep 90 beginning at the bottom of the neck scruff and ending at the tail joint. 2. Sidelines – The Belgian Hare is a slender/narrow rabbit, relative to its size. There should be no “bulkiness” to this rabbit in any area. To evaluate the sidelines it is best to get an “aerial” view of the Belgian Hare. If you are tall enough to get that “aerial” view while the Belgian Hare is posed, that is great. I am not, so I will evaluate the sidelines of the shoulders & midsection while the rabbit is in a relaxed position. A good idea of the side profile of the hindquarters cannot be gathered when the rabbit is relaxed because the hips will often relax to the sides making the rabbit look hippier than it actually is. In its alert posed position, I’ll run my hands along both sides to make sure the hindquarters blend with the midsection. The best sidelines are a slight taper, the midsection being larger than the shoulders, and hindquarters larger than the midsection, but a gradual blending of the three parts not steps. The worst sidelines are ones that are excessively bulky in either the shoulders or the hindquarters, a lesser fault are sidelines that have no taper and are just straight. 3. Rear view – The final aspect of type is what I refer to as “rear view” this adds the third dimension to our view of the Belgian Hare. This covers the roundness of the Belgian Hare as you go from side to side (perpendicular to the topline). The Belgian Hare should be well filled and rounded not square or angular in anyway. In conclusion, type is the most important aspect of the Belgian Hare. 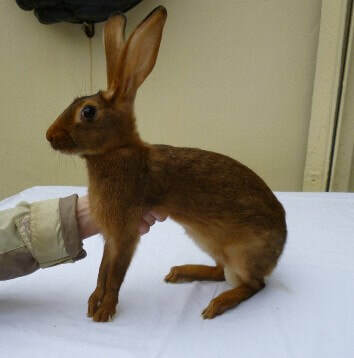 A Belgian Hare with perfect color is worthless if it has terrible type. In order for a Belgian Hare to have excellent type, it must have at least good feet & legs so that the topline starts and finishes in the right spots. There are only two breeds that have more points on color than the Belgian Hare, Standard Chinchilla @ 35 and Silver @ 50. The Belgian Hare has 20 points on color and 10 points on ticking. The standard states: “brilliant, rich, deep red, of a tan or chestnut shade”. I’ve seen it referred to as being the color of tin rust. Not orange colored rust, but that shade of rust that is just darker than orange. The color of the Belgian Hare must be bright enough to set off the ticking. Fault those Belgians that have dull color and those that have any grayness or yellow to their color. the distance from the inside edge to the outside edge exceeds the diameter of the eye. It should be a light creamish color. 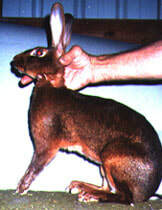 Ear lacing – The ear lacing of the Belgian Hare is definitely connected to the ticking aspect of the rabbit. 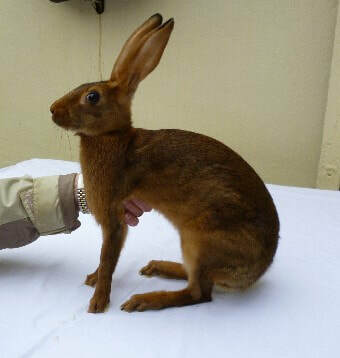 A Belgian hare with proper ticking will have great ear lacing. The ear lacing of a Belgian Hare should be confined to the upper 1/4 of the ear, be jet black and 1/4 inch wide. Ticking is by far the most difficult area of the Belgian Hare to perfect. There are many factors that affect the ticking appearance of the Belgian Hare; I’ll try to explain each aspect so that you’ve got a good understanding of what it takes to get perfect ticking. 1. Pattern of ticking – the ticking is to cover the upper back and hips of the Belgian Hare. There should be no ticking on the chest, belly, front legs, inside of the back legs. There can be a small amount of ticking on the checks, but heavy ticking on the checks is a fault. If ticking is found anywhere else on the body besides the upper back and outside the hips it should be faulted. 2. Amount of ticking – the amount of ticking can vary from heavy ticking that obscures the red color to so light that you can’t see the ticking at all unless you are a couple inches from the rabbit. The optimal amount of ticking is 25% of the surface color is Black (ticking) and 75% is red (base color). 3. Intensity of the ticking color – color intensity plays an important role on the ticking of the Belgian Hare. If the ticking is dull and not brilliant black, you will lose the sharp contrast of color that really makes Belgian Hare color pop. 4. Depth of ticking color on the fur shaft – If the brilliant black ticking color is confined to the just the very tip of the fur shaft the Belgian Hare will look salt and pepperish instead of having the wavy appearance. Conversely if the color travels too far down the fur shaft then the surface color will be excessively dark and you will be unable to see the waviness. 5. Finally, the size of the fur shaft will have a large impact on the appearance of the ticking. A fur shaft that is too fine will appear salt and peppery and a fur shaft that is too large will cause obnoxious blotches of dark color. You will need to look at the Belgian Hare in a posed position to evaluate the pattern of the ticking, and then step behind the rabbit to get the best view of the ticking over the hindquarter. The waves will only be visible from the rear view of the rabbit. 1. Weigh seniors, they have lots of size difference (6 to 9 1/2 lbs.). I’ve seen many that are in the 5 to 6 lb. range. 2. Don’t wrestle with the rabbit, if it doesn’t cooperate release it and start over. If it still doesn’t cooperate, return it to the holding pen for a little while and try again. 3. Head – long and narrow. 4. Ears – THIN! Crisp, narrow. During the pose the ears should be erect in an alert carriage. 5. Fur – Stiff Texture, lying flat with a brilliant finish. Fault Belgian Hares with large guard hairs or guard hairs with a wavy appearance. judge as most breeds. Give them a chance to feel comfortable on your table and challenge yourself to get them to lock up in a good pose. Good luck and enjoy the historic beauty that Belgian Hares are. ​When you look at the picture of the Belgian Hare in the ARBA Standard of Perfection, your attention is immediately drawn to its pose, standing on the toes of its fully extended front legs, ears erect, body carried high above the floor and with a wild look in its eye. If you have been around Belgians for a while, you will learn that this is the pose it takes only when excited, startled or when it is eagerly anticipating food or drink. It is not a pose that it would take in a relaxed, non threatening situation or in the intimidating surroundings of the showroom. How do you get you Belgians to pose as it the picture? The simple answer is that they have to be trained! But, before we start our discussion of training Belgian Hares to pose, we first must note that there is nothing in the ARBA Standards of Perfection to guide us on how a Hare is to be posed or even if a Hare should be posed at all for judging! 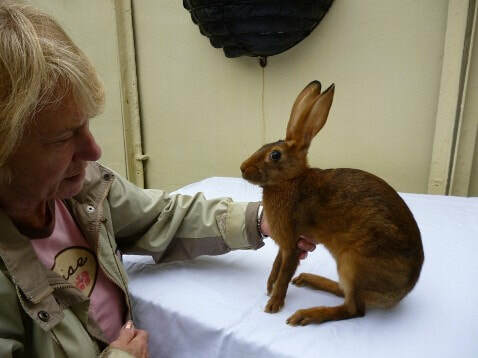 Indeed, some judges don't try to pose Hares, but rather just let them move about normally on the table or in special Judging cages if they are provided by the club sponsoring the show. However, most breeders and judges will agree that a Hare will show off its features best if posed in its "on alert" stance with its body carried high above the table on its tiptoes and with a wild expression in its eyes. The problem is that there are many ways an exhibitor can train a Hare to pose, and there are just as many ways that judges use to pose a Hare. If the Hare's training and the judges set-up technique "click", then it might be successfully posed; otherwise, the judging can degrade to a "wrestling match" ("acrobatics at a Halloween party" as characterized by the late Dr. Terry Reed) between the judge and the Hare during which time is wasted and the Hare, no matter how deserving, will be at a disadvantage to Hares that pose easily. How can these "wrestling matches" be avoided? Is it the responsibility of the judges, of the breeder/exhibitor, or both? Perhaps we can get some answers to these questions if we look at techniques used and advocated by some judges and breeder/exhibitors. and combinations of the above. Lets look at a description of each of these methods and comments on some of them as presented in past issues of the ABHC "Spotlight" and the ABHC Guidebook. In the "Natural Pose" method, no attempt is made by the judge to set up the Hare; instead, it is allowed to move about naturally in a judging coop. John C. Fehr wrote in the 1975 ABHC Guidebook, "Many a fine Belgian Hare loses out because of not being properly handled. You need not wrestle a Belgian Hare around nor stretch his limbs out like a chiropractor would do; he will show you in the coop where he is weak and where he stands out. Mr. Fehr described his judging technique as follows: "You must have a wire coop large enough so that your rabbit can run around and stand up, one for each entry. After you have taken them out to examine for disqualifications, they are placed back into the coop. Judging is then done in the coop. A good idea is to place one which looks good at the head of the class, the next best and so on. Now is the time to go along the line and study their action, moving them back or forward from coop to coop. Don't make snap judgments. After you eliminate your class down to the five winners, your job really begins all over again. Here the experienced Belgian Hare exhibitor has the advantage. He has worked with his Hares to the point that they are really proud to show off." By allowing the Hares to pose naturally takes the pressure off the judge to make the animals all assume a, more or less, identical pose. However, it requires the breeder/exhibitor to "condition" his hares so that they will move about the judging coop in a manner to show off their best attributes. A Hare cowering in the corner of the coop because of the intimidating surroundings and crowds will certainly will not show off his best stuff to the judge! What can the breeder do to prepare his animals? It's important that a breeder frequently handle his Hares so that they will be accustomed to being handled and examined. Placing them on the judging table before the show starts can get them familiar with the surroundings and placing them on your grooming table prior to judging can prepare them for the presence of spectators (a Hare on display seems to always be able to attract a crowd). 1. Position the hind legs in a manner such that the animal is sitting squarely on the hind legs in a natural position. 2. With one hand between the forelegs, the front portion of the Hare is gently raised and at the same time very gently pushed backwards until the animal extends its front legs. 3. During the extension of the front legs, a light amount of pressure is placed on the shoulders with the opposing hand. 4. As the Hare rests the tip of the toes on the extended limbs, the hand is removed from between the legs. 6. Stepping back from the table, it is anticipated that the animal will maintain position and look about alertly. 7. After the animal has been completely evaluated in the posed position, one can allow the animal to move back and forth on the table to evaluate the extension of limbs and other characteristics. Caution should be utilized not to "wear the animal out" on the table. 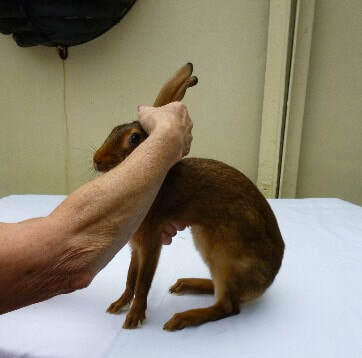 Dr. Reed advised, " The posing position will not "just happen" with regularity and it is anticipated that the younger the animal and the more frequent it is handled and posed, the more natural it will become for the Belgian Hare to pose on the table. However, with noise, strange environment, and other peculiarities, the position must be adjusted from time to time to accomplish the correct pose." He also advised that, "Due to the extremely long legs, long body, fine bone, and fragile ears, it is extremely important that when handling the Hare, one is very gentle and uses extreme caution in protecting the animal to the best of their ability. 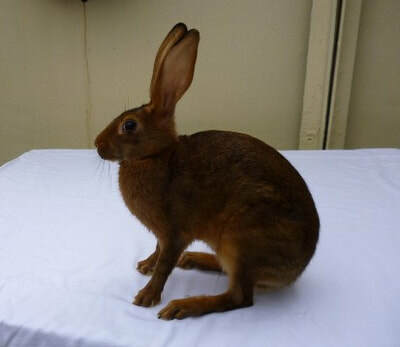 Due to the temperament of the Belgian Hare, one must be firm, but not aggressive in the handling procedure or the animal will become extremely excited and there is a possibility of self trauma to these beautiful creatures." 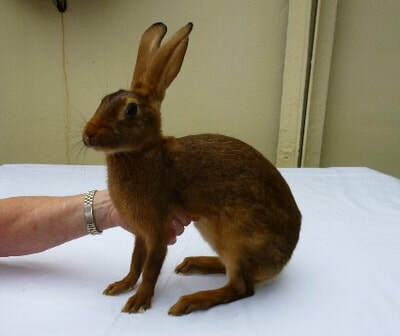 Most Belgian Hare breeders will agree that their animals are most certainly more robust than they appear and a judge should not be afraid of handling them in a normal manner. A Hare should, of course, not be abused, but neither should any other breed of rabbit. Ted Gordon described the "ear lift" method in the 1975 ABHC Guidebook. He noted, "Posing for show seems to be a matter of the Hare's confidence in the handler, much training so that the Belgian knows what is wanted, and the inborn proud attitude of the "King of the Fancy." "The system of training that seems to work for us begins at about weaning age. Time is spent every day even if it is just a minute apiece to get the animals used to being handled. I try not to "pet" them -- that is, stroke them from the shoulders to hips -- because then they tend to flatten out or crouch down (though they do enjoy being petted). Running both hands along the sides of the Hare, lifting the front quarters slightly and then tucking the hindquarters as you pass over them gives the young Hare the idea of being high on the front legs." To pose a Belgian Place the Hare on a piece of carpet facing left. 1. Place the back feet out at about 30 degrees on each side to give a good solid base to sit on, and untuck the tail if necessary. 2. Grasp the ears gently in your right hand and place the left hand, palm up and fingers pointing away from you, under the belly. 3. Move the left hand up to behind the front legs extending them fully. Lift with the left hand and at the same time gently raise the Hare with the right hand which is grasping the ears. Lift up and back with as much weight as possible on the rear feet. There is some gentle pull on the ears with your right hand, but you are also supporting the chest with the left hand. See the accompanying photograph for correct hand position. 4. Raise the Hare in this manner until his feet are clearing the carpet and hanging straight. Ease the pressure of the right hand on the ears and lower him slowly onto his tip toes, encouraging the Hare to support himself high on his front legs. "It will take many, many times to get a Hare to hold this stance at all -- as many as 20 to 25 attempts a day for a week before he learns. If he struggles, don't force him, but set him free and talk soothingly to him. Then start again. You gain the Belgian's confidence by working with him gently, and eventually he learns to enjoy the handling and seems to want to please you." Mr. Gordon noted that, "If the Belgian Hare is going to respond (and most, but not all, eventually do) it will come after many attempts, and each attempt should follow the same order so that the Hare becomes accustomed to the same routine each time. Once the Belgian Hare will bear his weight on the front legs, the next step is to get him to "hold it" for a longer and longer period of time, talking to him gently, praising his effort, and "radiating your pleasure at his performance. If you "feel with" your Belgians a sense of shared joy in each others existence, these beautiful sensitive animals will respond. The old timers tell me that years ago, a well trained Hare would "hold" for three minutes or more!!" The "Head Lift" method is a variation of the Ear Lift Method and is seen practiced by some judges and breeders/exhibitors that are reluctant or unaccustomed to pulling on a rabbit's ears, no matter how gently. It can also be use on individual specimens that refuse to have their ears grasped. 1. Place the Hare facing away from you and to the left with back feet out at about 30 degrees on each side to give a good solid base to sit on, and untuck the tail if necessary. 2. Similarly to the Ear Lift Method, place the left hand, palm up and fingers pointing away from you, under the belly. Instead of grasping the ears, place the right hand along the Hare's left cheek. Place your bent thumb behind the ears and a finger under the Hare's chin. Use whatever finger is suitable to avoid placing pressure on the Hare's throat. Doing so will cause the Hare to struggle. 3. Move the left hand up to behind the front legs extending them fully. Lift with the left hand and at the same time gently raise the Hare's head with the right hand. Lift up and back with as much weight as possible on the rear feet. With you thumb, position the ears in the vertical position. 4. Raise the Hare in this manner until his feet are clearing the carpet and hanging straight, and slowly lower him onto his tip toes until his feet touch and the legs bear his weight. At some point, you will feel his body relax; when you do, slowly withdraw your left had from beneath his belly. 5. The Hare's head should remain positioned by the right hand as pictured in the accompanying photograph. You will feel the Hare start to support his head and ease the pressure on your right hand. As he does, remove your right hand slowly in a manner that you do not brush the Hares whiskers abruptly. Doing so will make him flinch. 6. Anticipating that the Hare will hold this pose, stand back smartly and evaluate the animal. When training the hare to pose, lavish praise on him when he holds a pose, even if very briefly. Sometimes a treat such as a raisin or a black sunflower seed given in reward for a good performance will solidify his training. After repeating this procedure frequently, 20 or more times daily for a week, you will find the Hare holding the pose quickly will little effort on your part. Ideally, he will snap into the pose when placed on the carpet and hold it for a brief period of time, but only few progress to that type of performance. Some popular Belgian Hare judges are currently using a previously undescribed, but apparently very successful method of posing Hares. This method seems to work on both highly trained animals and those who have had only minimal training. Furthermore, this method appears to induce a Hare to show off its finest attributes, and it can net outstanding and consistent results. 1. Place the Hare on a piece of carpet at a 45 degree angle so that it is facing your right shoulder. 2. Straighten out the tail with your left hand if it is tucked under the body, and place your fingers under the body from the rear. 3. Place your right hand at the left cheek of the Hare, fingers extended. Place the bent forefinger in back of the ears, the bent ring or small finger under the chin, and the thumb on the forehead. Be careful not to put any pressure on the throat of the Hare or it will start struggling. 5. Gently lower the Hare to the rug, tapping its front feet on the rug to encourage it to stand on its toes. Some will gently message the Hare's forehead with the thumb of the right hand to quiet the animal before releasing it; however, I have not found this particularly useful. 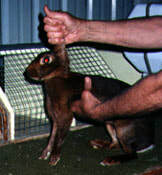 Slowly slip the left hand from under the hind end, and as the Hare relaxes, remove your right hand from its head and step back to evaluate it. If at any time the Hare starts to struggle during posing, release it and start over again. This method seem to work best if the handlers actions are assertive but not abusive. Also, watch the palm of your right hand because it is in a vulnerable position should the Hare decide to bite. The particular advantage of this method is that it will encouraged the Hare to both stretch and position its body, both front and rear, well off the rug. As pointed out at the beginning, this is only a sampling of methods in use to pose Hares. There are probably other methods available and combinations of methods that will induce a Hare to assume the desired pose. However, it is important to note that a Hare will not pose without some effort be expended on the part of the breeder/exhibitor. With the many posing methods practiced by various judges, a breeder can only hope to expose his animals to enough of a variety of methods so that it will respond to the judges handling no matter what technique he uses. However, it means a lot of work by the breeder if he wants his animals to excel. It would be beneficial for both breeders and judges alike if some agreement, formal or informal, could be reached on a "standard" procedure. I have no propositions or suggestions on how such an agreement could be arrived at. I'm certainly no judge, but it seem to me that the most the most convenient way to pose and judge the Belgian Hare by the "natural method" in special judging cages which are 1) large enough for the Hares to move about and stretch and 2) are available in sufficient numbers to allow a whole class to be judged simultaneously. However, not many clubs sponsoring shows provide judging cages or are even aware that they may be desirable. They will only provide such equipment if both the breeders and the judges make them aware that such equipment can make the judging proceed faster and be more satisfying for all involved. To cope with situations where adequate equipment may not be available, both the judges and the breeders must be knowledgeable of the various methods available to pose Hares. The judge should be flexible enough in his techniques to bring out the best qualities if the animals he is judging, and the breeder should try to prepare his animals for whatever it encounters on the judging table. The judge encountering some of his first Belgian Hares on the judging table should be assured that these animals are more rugged than they look and that he should approach the task of judging confident that he has the full understanding and support of the breeders on the other side of the table.